Orientation is important: The cell's fate depends on where you place the spindle. Stem cells are a critical population of cells that have the incredible ability to modulate their divisions depending on the requirements set by the physiological context. This ability allows stem cells to actively repair any damage that may have occurred while also maintaining a pool of identical daughter stem cells that are waiting in the wings in case of emergencies. Thus, stem cells can either divide symmetrically, where the two daughter cells have identical fates as new stem cells, or asymmetrically, where one daughter maintains a stem cell fate and the other differentiates to continue tissue repair. Importantly, the orientation of the mitotic spindle and the resulting axis of division has previously been shown to directly impact (a)symmetric divisions and potentially be a key determinant of cell fate. However, the exact mechanisms that regulate this switch and how it may be connected to spindle orientation are still unknown. Using intestinal stem cells (ISCs) from Drosophila melanogaster, Hu and Jasper exploit the plasticity of this system to investigate the effect of various stresses on ISC divisions as they switch between symmetric and asymmetric divisions. Asymmetric divisions are more predominant during homeostatic tissue regeneration and after tissue damage, while symmetric divisions are favored during growth. JNK signaling has also been implicated in stressful conditions to induce ISC divisions. Taking advantage of the plethora of studies done in various Drosophila tissues, the authors have pieced together a multi-layered mechanism that includes JNK signaling, spindle orientation proteins, and transcriptional repression. Starvation and refeeding cycles to stimulate growth, termed “adaptive resizing”. Infection with Ecc15, a bacterium known to damage the intestine and stimulate regeneration. Exposure to paraquat to induce oxidative stress, a more severe condition that results in epithelial dysplasia and is reminiscent of aging dysfunction. For each of these conditions, they determined the predominant spindle orientation by measuring the angle created between the pole-to-pole axis of the spindle and the epithelial basement membrane. Measurements near 0° are planar to the basement membrane, indicating symmetric divisions. In contrast, asymmetric divisions are oblique with a much larger angle. They determined that normal, homeostatic conditions had oblique spindles (asymmetric divisions), while periods of growth had planar (symmetric) divisions. Ecc15 infection led to mostly oblique spindles as well, similar to homeostatic conditions, while the more severe paraquat exposure led to a planar shift in orientation. Live imaging revealed that oblique spindles are oriented dynamically during mitosis. ISC divisions can be either symmetric, where the angle is close to 0°, or asymmetric. From Figure 1. In order to elucidate a mechanism that controls spindle orientation, the authors tested whether JNK activation led to increased planar spindles. Increasing JNK activity through genetic manipulations increased ISC proliferation and induced planar spindles, importantly phenocopying the results during adaptive resizing or paraquat exposure. As the authors continued to investigate the role of JNK activation in spindle orientation, they found two unique mechanisms involved. First, previous transcriptomic data suggested that a kinesin, Kif1a, was decreased when JNK was activated. Indeed, Kif1a depletion increased planar spindle orientation, but more strikingly, overexpression of Kif1a after paraquat exposure was sufficient to block planar spindle orientations. Secondly, the authors focused on Wdr62, a centrosome-associated protein that has been shown to recruit JNK to the spindle in mammalian glial cells to orient the spindle. Overexpression of Wdr62 caused spindles to become planar, while RNAi depletion was sufficient to prevent spindles from becoming planar in JNK- or paraquat-induced stress conditions. Using mosaic flies, only clones homozygous for Wdr62 deficiency maintained oblique spindle orientations despite paraquat exposure, suggesting a key role for Wdr62 to control spindle orientation under stressful, JNK-activating conditions. Of note, no obvious spindle assembly defects were observed, although Wdr62-deficient clones resulted in smaller cell sizes. Both of these mechanisms are compelling arguments supporting the role of JNK signaling in spindle orientation, and the authors add another layer to this process by examining LGN and NuMA (Pins and Mud in Drosophila, respectively), two classically-known spindle orientation proteins. Depletion of either increased the number of planar spindles, and interestingly, NuMA localization shifts to the spindle after paraquat treatment and JNK activation and remains at the cortex when JNK signaling is eliminated. This reveals that JNK activity promotes release of NuMA from the cell cortex to the spindle, resulting in planar orientation of spindles. NuMA (Mud-GFP) at the spindle poles instead of the cortex in planar divisions. From Figure 5. Finally, the authors examined the effect of JNK signaling on spindle orientation in aging animals, where they saw that the intestinal epithelium of older flies had increased planar spindle orientations and increased mitotic activity as well. Strikingly, they were able to rescue the oblique spindle orientation when JNK activation is repressed, Wdr62 is depleted, or Kif1a is overexpressed. This demonstrates clearly that over-activation of JNK signaling and its subsequent interactions with Wdr62 and repression of Kif1a causes increased planar cell divisions and aberrant cell fates during the natural aging process. These rescue experiments also demonstrate that spindle orientation defects are potentially reversible. In addition to the subcellular rescue of spindle orientation, the authors asked if these genetic manipulations were sufficient to protect the integrity of the intestinal tissue, which normally loses its barrier during aging. 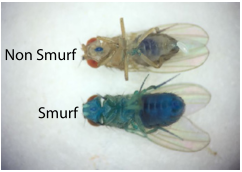 In the aptly-named Smurf assay, older flies were fed food with a blue dye that can spread to the entire body if the intestinal barrier function declines, causing them to turn blue. The authors found that the knockdown of Wdr62 or overexpression of Kif1a resulted in decreased numbers of aged Smurf flies, indicating better intestinal barrier health. Thus, remarkably, manipulating spindle orientation is sufficient to prevent the loss of tissue integrity and function in the intestine. Flies become blue Smurfs when the intestinal barrier degenerates. From Figure 7. In this preprint, Hu and Jasper demonstrate a large amount of work that went into dissecting the intricate mechanisms that orient the mitotic spindle during various stress conditions, as well as larger scale physiological consequences of perturbing these mechanisms. The authors tackled a large, potentially very convoluted process, especially given how many other pathways JNK signaling is involved in, and importantly demonstrated the plasticity and reversibility of this process, as spindle orientation can clearly respond to environmental cues and even help maintain tissue function over a longer timescale. Model for switching between symmetric and asymmetric divisions in ISCs. From Figure 7. The mechanisms described here are very separate, where JNK activation is the main connection between all of them. How are the mechanisms that involve Kif1a, Wdr62, and NuMA/Mud connected to each other, if at all? Which of these mechanisms begins to “fall apart” during aging to lead to more planar, rather than oblique, divisions – is it one specific mechanism or sequential accumulation of all three? Why would Wdr62 deficiency lead to smaller clones despite lack of spindle assembly defects? Was this also seen in the RNAi depletion experiments? What is the normal, known role of Kif1a in mediating spindle assembly or orientation?